Larger Project 1-12, Breakfast Room » Roger Perron Inc. Here is the breakfast room, centered in the rear between the family room and kitchen, overlooking the yard and pool. 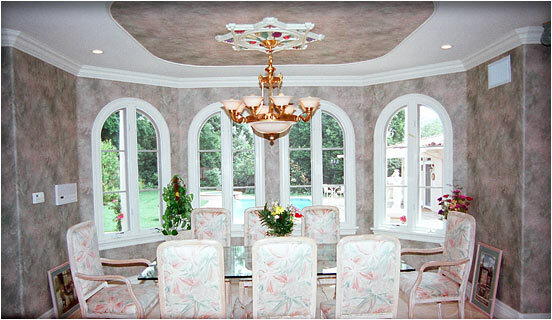 The ceiling detailing is 3/4″ thick drop with flex molding and faux wallpaper. The medallion in the center of the ceiling is a hand-painted foam cast. Architectural design for this major home remodel with additions and luxury floor plan in San Marino created by Roger Perron, design-build contractor, with contributing architects Curt Sturgill and Bob Cooper.